Unlock special NHL player items featuring players that are known for their impeccable moustaches through the Movember Set! *Movember Silver Player and Movember Gold Player sets will only be available when there is an active and available item. Additionally, the Movember Silver Player and Movember Gold Player sets are repeatable. There will be a four round HUT Movember Competitive Season that you can compete in for the opportunity to earn rewards like Movember packs, coins and more! The Movember Competitive Season will run from November 1st to November 29th and each round will be 7 days long. Click here to view the full Competitive Season rewards for the Movember Competitive Season. There will be 5 new limited-time Movember HUT Challenges available for you to play in each week. Through these Movember HUT challenges, you’ll be able to earn Movember Collectibles, Movember Player items, coins and more! Throughout the Movember Event, there will be inform player items for players that sport their own moustaches and the Movember foundation. Every Movember player item will feature an extra Locker Room Leaders synergy. There will be a new HUT Movember Draft Champions theme available throughout the event. 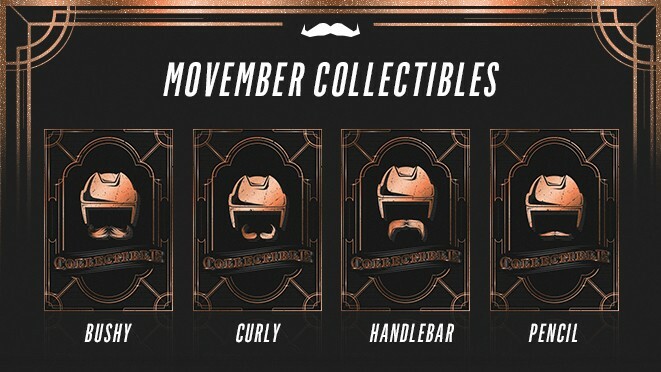 In this theme, you will be able to find Movember player items in rounds to select for your Draft Champions theme. Additionally, there is a prospect of earning a HUT Movember-themed reward if you win all four games with the Movember Draft Champions theme. Be sure to get into the game from November 1st to November 30th before the HUT Movember event ends! On a related note, EA Sports NHL is also making a one-time $35,000 donation towards the Movember Foundation to improve mental health and reduce the rate of male suicide.